I'd like to do two things on my progress bar. Change the green colour to red. Remove the blocks and make it in one color. Any information about those two things I wonder how to accomplish will be greatfuly appreaciated! Note the second parameter in SetState, 1 = normal (green); 2 = error (red); 3 = warning (yellow). This is a flicker-free version of the most accepted code that you can find as answers to this question. All credit to the posters of those fatastic answers. Thanks Dusty, Chris, Matt, and Josh! Like "Fueled"'s request in one of the comments, I also needed a version that behaved a bit more... professionaly. This code maintains styles as in previous code, but adds an offscreen image render and graphics buffering (and disposes the graphics object properly). // None... Helps control the flicker. const int inset = 2; // A single inset value to control teh sizing of the inner rect. rect.Inflate(new Size(-inset, -inset)); // Deflate inner rect. if (rect.Width == 0) rect.Width = 1; // Can't draw rec with width of 0. In the designer, you just need to set the ForeColor property to whatever color you'd like. In the case of Red, there's a predefined color for it. Modificaton to dustyburwell's answer. (I don't have enough rep to edit it myself.) Like his answer, it works with "Visual Styles" enabled. You can just set the progressbar's ForeColor property in whatever form's design view. I just put this into a static class. Usually the progress bar is either themed or honors the user's color preferences. So for changing the color you either need to turn off visual styles and set ForeColor or draw the control yourself. Or as someone else pointed out, disable the VisualStyles for your application. I suggest you to take also a look to this article on CodeProject: Progress-O-Doom. It's great! See http://www.vbforums.com/showthread.php?t=248721 for an example. All these methods fail to work for me but this method allows you to change it to a color string. Please note that i found this code from somewhere else on StackOverflow and changed it a little. I have since forgot where i found this code and i can't link it because of that so sorry for that. But anyway i hope this code helps someone it really did help me. Where the name "ProgressBar" is used replace with your own progress bar name. You can also trigger this event with other arguments just make sure its inside brackets somewhere. I noticed that if you change the value of the bar ( how big it is ) then it will not change if it is in a color other than the default green. I took user1032613's code and added a Value option. Just in case anyone looks for another option.... you can extend a Panel, use it as background (white or whatever), add another Panel inside it for the foreground (the moving bar). Then you have total control changing the color, etc. Simply right click on your project in Visual Basic Solution Explorer (where your vb files are) and select properties from the menu. In the window that pops up deselect "Enable XP Visual Styles" and now when you set forecolor, it should work now. 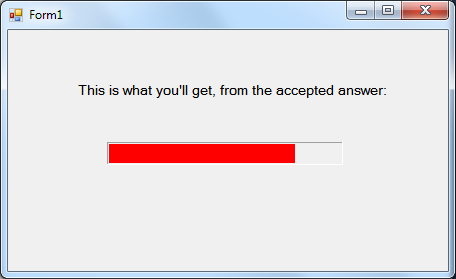 Јοеу: Quote: Usually the progress bar is either themed or honors the user's color preferences. So for changing the color you either need to turn off visual styles and set ForeColor or draw the control yourself. Block(s) will only work with visual styles disabled ... which renders all of this a moot point (with regards to custom progress color) With vistual styles disabled ... the progress bar should be colored based on the forecolor. I used a combination of William Daniel's answer (with visual styles enabled, so the ForeColor will not just be flat with no style) and Barry's answer (to custom text on the progress bar) from: How do I put text on ProgressBar? I started with the answer from 'user1032613' on 3/17/12. Note that this is now a Module, not a class. From there I converted the code but more was needed. In particular the converted code showed a DirectCast function to convert the 'state' integer to a IntPtr type which didn't work. BTW - I tried other colors - 0, 4, 5 - they all just displayed green. I know its way too old to be answered now.. but still, a small tweak to @Daniel's answer for rectifying the problem of not showing zero valued progress bar. Just draw the Progress only if the inner rectangle's width is found to be non-zero. Thanks to all the contributers. I found this can be done by drawing a rectangle inside the progress bar, and to set its width according to the progress's current value. I also added support for right to left progress. This way you don't need to use the Image, and since Rectnalge.Inflate isn't called the drawn rectangle is smaller. Edit: in the two minuites it took me to fire up vs and check the syntax i was beaten to it with much better responses. i love this site. Any simple way to change color of Progress Bar in C#? How do I put text on ProgressBar? How to drawn my own progressbar on winforms? Visual Studio 2010: Progressbar does not change color? How do I change the color of my progress bar in Inno Setup? How can I create a color with values for green, blue, orange, and gold only? How to change row color in datagridview?